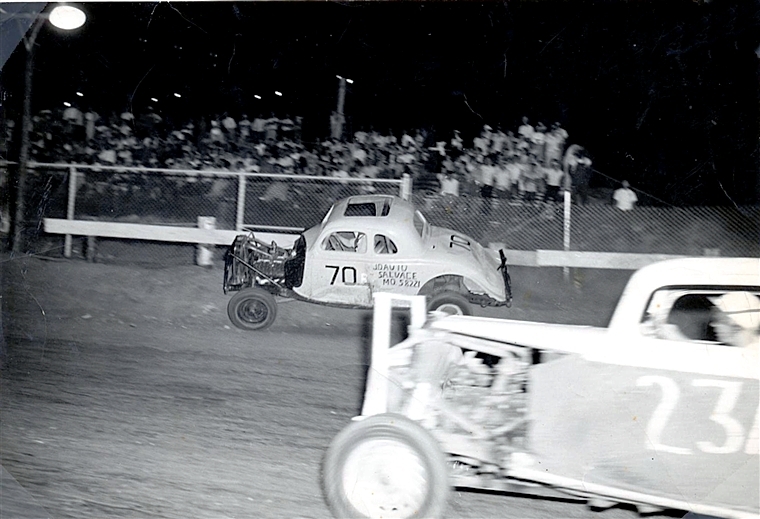 Melvin Herrell at the wheel of his first stock car at Jayhawk Park in Newton, Kansas in 1954. He also owned this 1940 Ford that had been a slick street car until his future wife was involved in a traffic accident with it. Click your mouse on the photo to see a full size version of this photo showing Melvin in an accident himself involving car driven by Clarence Cochran. Melvin driving a Ford jalopy owned by Henry Ellington of Hutchinson, Kansas at Jayhawk Park in Newton, Kansas c1955. Click your mouse on the photo and you will see that this photo is part of a larger photo showing Melvin just missing a crash that night. 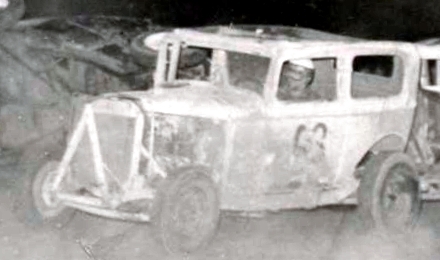 Car #3B in that photo was being driven by Alvin Riley of Medora, Kansas and car #48 was owned by Harold Dean of Newton, Kansas but it is not known who was driving it on this occasion. 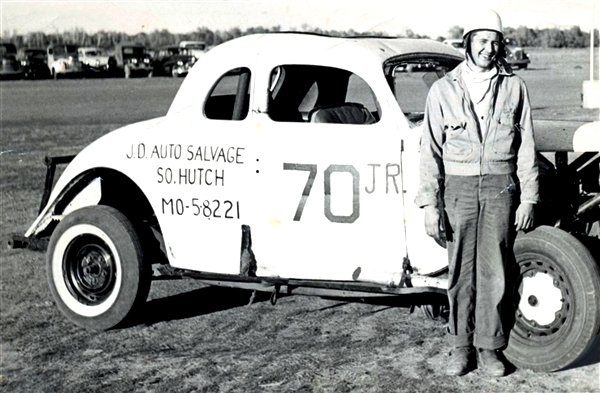 Melvin with a Ford coupe he drove for Dewayne Caulley of Hutchinson, Kansas. 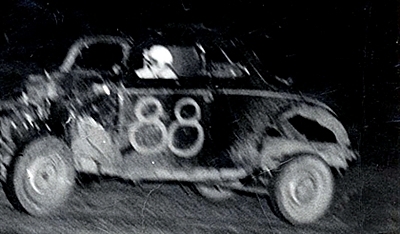 Among the races that Melvin competed in driving this car was the first National Championship Jalopy Races at Taft Stadium in Oklahoma City in 1957. Click your mouse on the photo to see another of Melvin driving this car up on the banking (and then some) at Mohawk Speedway at Hutchinson. 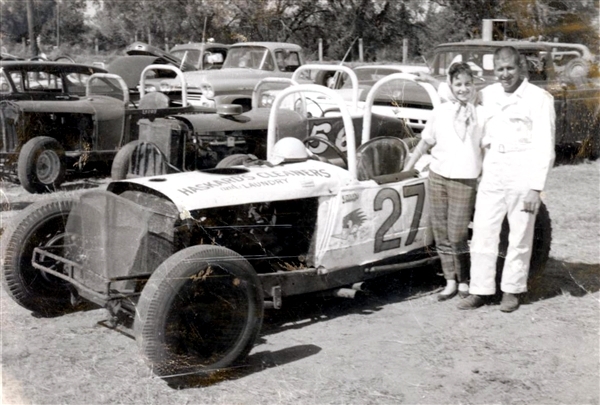 Melvin and wife Joyce at Woodward, Oklahoma with a rail usually driven by Jay Schrock but Melvin drove it this day for owner Pat Haskard of Hutchinson, Kansas. Melvin with a V-8 Ford flathead powered rail that he drove for owner Jack Blanton of Hutchinson, Kansas in 1960. 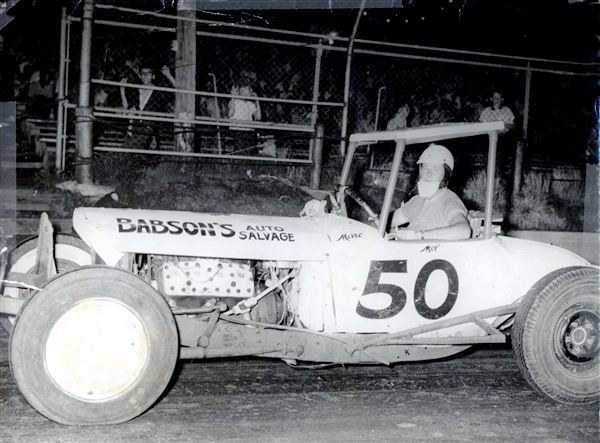 Melvin driving a V-8 Ford flathead powered rail owned by Harold Miller of Hutchinson, Kansas at “81” Speedway at Wichita, Kansas in 1962. He also drove this car renumbered as #52 in the Hutchinson Nationals that same year. 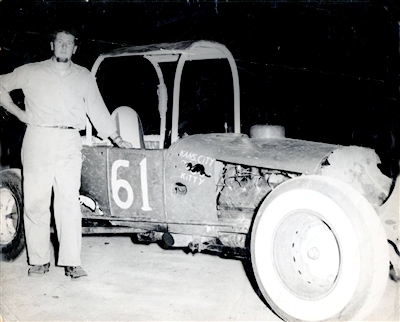 Melvin at “81” Speedway at Wichita, Kansas beside a straight-eight Buick powered rail he drove for Pete Egbert of Hutchinson, Kansas in 1963. 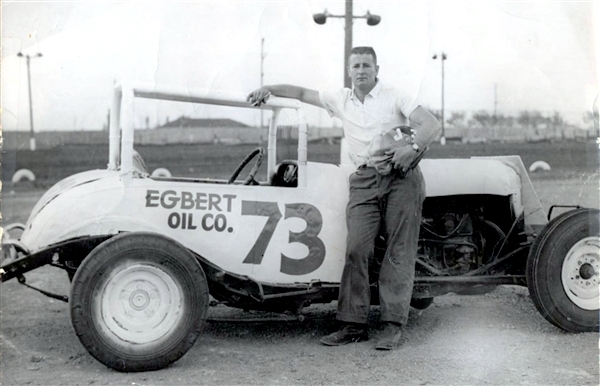 Egbert had purchased the car from Paul Befort, Jr. of Garden City, Kansas. Click your mouse on the photo to see another one taken after Melvin had become involved in a skirmish with a couple of other cars at “81” Speedway. Melvin with a brown straight-six Ford powered rail he drove for Ken McCoy of Hutchinson, Kansas in 1964. 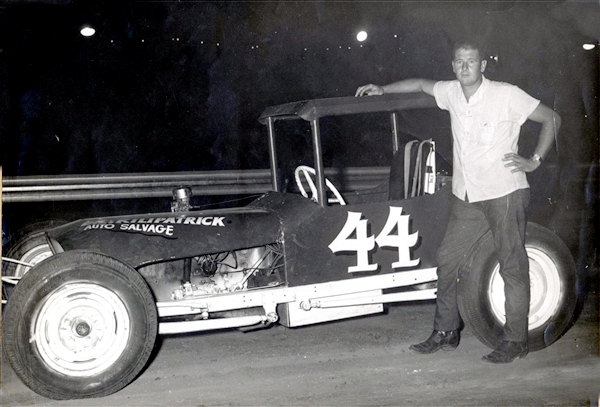 Melvin drove for H. L. Woodman of Hutchinson, Kansas in 1965 but Woodman traveled a lot so Melvin did most of the work on the car himself. One night, he fell asleep while working under the car. The next morning, he told his wife that he was tired of working on race cars so that was going to be his last season to drive them. A blown engine at WaKeeney, Kansas late that summer might have ended Melvin’s career early. Melvin told Woodman of his plans to retire and offered to give him his car back. Instead, Woodman purchased another engine for the car and talked Melvin into racing it at the Kansas State Fair in Hutchinson that fall. 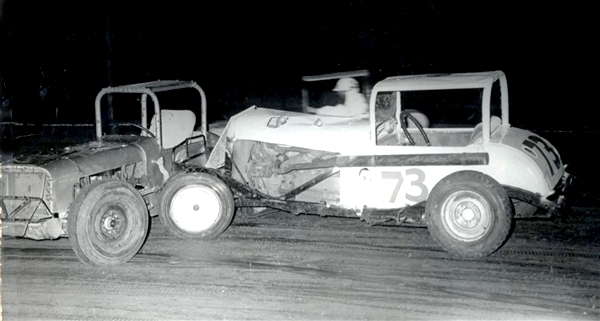 While competing in the B feature at the state fair on September 22, 1965; an axle broke sending the car into the outside crash wall in front of the grandstands overturning several times. When the car came to rest, only one wheel remained on the car. Woodman kept the engine and told Melvin that he could do whatever he wanted to with the rest of the car. Melvin sold the body and everything else he had left that was connected to the car (including his helmet and goggles) to someone in Wichita thus concluding his racing career.